The NADPH oxidase was originally discovered in neutrophils, where it is a potent source of millimolar quantities of superoxide (O2−) during phagocytosis and plays a vital role in nonspecific host defense (1). It comprises a membrane-associated cytochrome b558, composed of one p22phox (where phox stands for phagocyte oxidase) and one gp91phox subunit and at least four cytosolic subunits (p47phox, p67phox, p40phox, and the small GTPase rac1 or rac2) (1). The enzyme is normally dormant in resting neutrophils but is rapidly activated upon appropriate stimulation in a process involving the translocation and association of cytosolic subunits with the membrane-bound cytochrome b558. Mutations in essential components of the oxidase lead to the condition of chronic granulomatous disease, which is characterized by recurrent life-threatening infections. It has become apparent in recent years that nonphagocytic cells such as fibroblasts; endothelial cells; vascular smooth muscle cells (VSMC); and renal mesangial, tubular, and other cells also possess O2−-producing enzymes analogous to the phagocyte NADPH oxidase (2–7⇓⇓⇓⇓⇓). The nonphagocytic NADPH oxidases are structurally related to but functionally distinct from the widely studied neutrophil oxidase. The three most striking differences are that (1) they seem to generate constitutively low levels of O2− even in unstimulated cells; (2) although enzyme activity can be upregulated in several pathologic settings, measurable O2− production is still much lower than that found in activated neutrophils; and (3) a substantial proportion of the ROS generated in nonphagocytic cells seems to be intracellular, whereas neutrophil O2− generation during phagocytosis is thought to occur in the extracellular (phagosomal) compartment. The low amounts of ROS produced by nonphagocytic NADPH oxidase may function as second messengers to influence redox-sensitive signal transduction pathways (referred to as redox signaling). However, when upregulated, the higher amounts of ROS may contribute to oxidative stress (3,8⇓). There are several structural similarities between neutrophil and nonphagocytic NADPH oxidases. For example, both types of oxidase express p22phox, p47phox, and rac1 subunits. The p67phox subunit has been found in endothelial cells, mesangial cells, and fibroblasts but apparently not in VSMC (2,9,10⇓⇓). Both oxidases possess a catalytic moiety (gp91phox or an isoform) with flavin-binding and heme-binding regions that are involved in the transfer of electrons and are inhibitable by the flavoprotein inhibitor diphenyleneiodonium. They both preferentially use NADPH as the electron donor to produce O2− (9), although nonphagocytic NADPH oxidases may also use NADH as substrate (2). gp91phox is the β-subunit of cytochrome b558 and is the key catalytic subunit of the NADPH oxidase. Several homologues of gp91phox, termed Nox (for NADPH-oxidase), have recently been reported to be expressed in nonphagocytic cells (11). Nox 1 to 5 are 65-kD core proteins, whereas Duox 1 and 2 are 175- to 180-kD proteins that have a domain homologous to gp91phox as well as an additional peroxidase domain (11). Using this new terminology, Nox2 represents the neutrophil gp91phox (Table 1). gp91phox is also a 65-kD core protein but runs as a broad band at up to approximately 90 kD on SDS-PAGE as a result of posttranslational glycosylation. The first homologue of gp91phox, namely Nox1, was found to have significant pro-proliferative activity and is also therefore known by the alternative term mitogenic oxidase or Mox-1. Nox1 shares 56% sequence homology with neutrophil gp91phox (2,12⇓). Nox3 is known only from its genomic sequence (11). A homologue of gp91phox termed Nox4 (or Renox) has been cloned in the kidney. The predicted Nox4 protein consists of 578 amino acids with 39% homology to neutrophil gp91phox and has been found to be a renal source of ROS production (6,13⇓). Nox4 expression was found to be abundant in human distal tubular cells and suggested to function as an oxygen sensor for erythropoietin synthesis (6,13⇓). Nox4 was also found abundantly expressed in fetal kidney, an organ that is not considered to produce highly erythropoietin; it might be involved in the regulation of renal cell growth and death (6). In the neutrophil, it is generally accepted that the majority of the gp91phox-p22phox heterodimer is located on the plasma membrane, whereas other regulatory subunits are distributed in the cytosol (1). Upon neutrophil activation, the “cytosolic” components p47phox, p67phox, p40phox, and rac1 translocate to the membrane and associate with the cytochrome to produce O2− (1). On the basis of the above information, it was assumed that in unstimulated nonphagocytic cells, the NADPH oxidase would also comprise a predominantly plasma membrane-bound cytochrome b558 with the other units present in the cytosol. However, this model of oxidase structure fails to explain the “constitutive” oxidase activity present in unstimulated (by agonists) nonphagocytic cells or that a substantial proportion of the ROS generation is intra- rather than extracellular. Recently, using a range of complementary methods including confocal microscopy, plasma membrane protein biotinylation, subcellular fractionation, and co-immunoprecipitation, we showed that (1) the vast majority of NADPH oxidase subunit expression and functional activity in endothelial cells is intracellular rather than plasma membrane bound; (2) a significant proportion of the NADPH oxidase subunits in unstimulated cells are present as fully preassembled and functional ROS-generating complexes; and (3) the functional oxidase is associated with the intracellular cytoskeleton, particularly in a perinuclear distribution (14). Because the association of “cytosolic” subunits with cytochrome b558 is thought to initiate oxidase activity, the finding of seemingly preassembled NADPH oxidase complexes in endothelial cells is likely to account for the low-level ROS-generating activity observed in unstimulated nonproliferating cells (14,15⇓). The interaction between the cytoskeleton and oxidase components may play an important role in localizing and stabilizing the NADPH oxidase complex. In this setting, cytoskeletal elements may provide a scaffold on which the oxidase components can assemble readily and where the stability of the complex can be maintained (14). Although the structure of the NADPH oxidase in other nonphagocytic cells has not yet been reported, it seems likely that it will be similar. One of the particular attributes of the nonphagocyte NADPH oxidase is that the oxidase not only is “constitutively” active but also responds to hormones, growth factors, cytokines, and mechanical stress (2,8,16–20⇓⇓⇓⇓⇓⇓). Precise mechanisms underlying agonist-induced nonphagocyte NADPH oxidase activation are not yet understood, but it is clear that both acute protein modification and chronic changes in expression levels may be involved. Several studies have shown a crucial role of the p47phox subunit in agonist-induced (angiotensin II [Ang II], PMA, TNF-α, growth factors, and thrombin) vascular cell NADPH oxidase activation (18,21–23⇓⇓⇓) and in the development of atherosclerotic lesions in ApoE−/− mice (24). We also found that coronary microvascular endothelial cells isolated from wild-type mice respond to PMA and TNF-α with a significant increase in O2− generation. This response was completely lost in cells isolated from p47phox knockout mice. Transfection of the full-length p47phox cDNA into p47phox−/− coronary microvascular endothelial cells (CMEC) caused expression of p47phox protein and restoration of the ROS response to PMA and TNF-α. In wild-type CMEC, transfection of antisense p47phox cDNA substantially reduced p47phox expression and caused loss of the ROS response to PMA and TNF-α (18). It is widely known that p47phox phosphorylation plays a pivotal role in neutrophil NADPH oxidase activation by providing physical binding domains to cytochrome b558 and p67phox (25). The kinetics of activation of NADPH oxidase correspond to the kinetics of p47phox phosphorylation (25,26⇓). It is possible that phosphorylation of p47phox may also play a role in agonist-induced upregulation of nonphagocytic NADPH oxidases. Another regulatory subunit that has been well studied in nonphagocytes is the GTPase rac1, which binds to p67phox and activates NADPH oxidase in its GTP-bound state (27). Microinjection of constitutively active h-rac1 into HepG2 cells increases NADPH oxidase–dependent ROS generation, whereas microinjection of dominant-negative mutant h-rac1 inhibits NADPH oxidase (28). In endothelial cells, dominant-negative rac1 abrogates both basal (29) and shear stress-induced NADPH oxidase–dependent ROS production (30). Abid et al. (31) found that human endothelial cell responses to vascular endothelial growth factor required a threshold level of NADPH oxidase–generated ROS, which was regulated by rac1. Similarly, Page et al. (32) reported that PDGF-induced cell cycle activation in airway smooth muscle cells was NADPH oxidase dependent and was inhibited by a dominant-negative allele of rac1. Another feature of nonphagocyte NADPH oxidase from the literature is that enzyme activity may be regulated by its own product, ROS. Kovacic et al. (33) showed that rac1-induced O2− production in human aortic endothelial cells was connected to a feedback loop whereby rac1 protein turnover was accelerated via increased degradation of rac1 by the proteasome and was strongly dependent on the redox status of the cell. ROS such as H2O2 promote the degradation of ubiquitinated rac1, whereas inhibitors of NADPH oxidase such as diphenyleneiodonium block the degradation of ubiquitinated rac1 by the proteasome (33). Conversely, Li et al. (34) showed a feedforward mechanism, such that exogenous exposure of SMC or fibroblasts to H2O2 activated NADPH oxidase to produce endogenous O2−, thereby amplifying the vascular injury process. 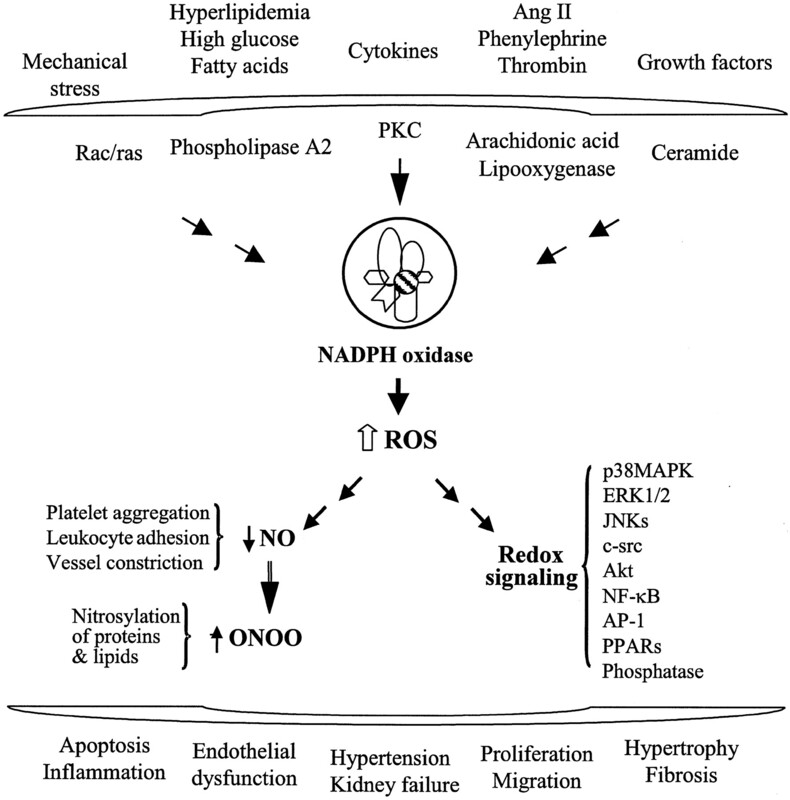 The hypothesis is that the self-limiting mechanism may be involved mainly in the maintenance of the low output of the nonphagocyte NADPH oxidase during physiologic conditions, whereas the feedforward mechanism may play a role in NADPH oxidase–dependent oxidative stress in a variety of diseases, including atherosclerosis and inflammation. The amount of ROS produced by nonphagocyte NADPH oxidase is normally relatively low, even in many pathologic settings, and is mainly generated in the intracellular compartment. The low amount of ROS thus generated has been shown to be important in redox signaling in numerous cellular processes such as cell growth, apoptosis, migration, and extracellular matrix remodeling (2,35⇓). The magnitude and location of the rise in intracellular ROS may serve as important determinants of signal transduction pathway activation. ROS-induced reversible changes in protein thiols result in conformational changes that may affect DNA binding or enzymatic activities. Many signaling molecules that contain cysteine residues have been found to be redox sensitive, including the transcriptional factor NF-kB, the small G protein p21ras (Ras), and Src (8,36,37⇓⇓). It has been clearly demonstrated that ROS generated by NADPH oxidase are involved in signal transduction in response to several cytokines, e.g., Ang II, thrombin, PDGF, TNF-α. Agonist binding to receptor rapidly activates NADPH oxidase followed by elevated intracellular O2− and H2O2 levels and activation of signaling molecules including protein tyrosine kinases, serine/threonine kinases, phospholipases, and Ca2+-dependent pathways. In VSMC, Ang II–dependent rises in intracellular Ca2+ can be blocked by inhibitors of NADPH oxidase or genetic manipulation of NADPH oxidase expression (2,8,29,38⇓⇓⇓). In blood vessels, Ang II infusion results in an increased expression and activity of NADPH oxidase, which is partly PKC dependent (39). In the heart, Ang II increases O2− production and cardiac hypertrophy only in wild-type animals but not in gp91phox knockout mice, suggesting a role for NADPH oxidase (36). Several members of the mitogen-activated protein kinase (MAPK) family are redox sensitive. Ang II–induced MAPK activation in vascular cells requires NADPH oxidase–derived ROS because Ang II was unable to activate MAPK in aortas from p47phox knockout mice (23). Similarly, in cultured VSMC, Ang II–induced MAPK activation could be inhibited by antisense oligonucleotides or an antibody against p22phox, implicating a role of NADPH oxidase–derived ROS (40). In the heart, we also found a good correlation between NADPH oxidase–derived ROS production and MAPK activation during the development of cardiac hypertrophy (41). Normally, cells possess antioxidant defense systems that include ROS degrading molecules (ROS scavengers), such as uric acid, ascorbic acid, and sulfhydryl-containing molecules (e.g., glutathione), and antioxidant enzymes, such as catalase, glutathione peroxidase, and superoxide dismutases. In pathologic conditions, in which excessive production of ROS outstrips endogenous antioxidant defense, oxidative stress may irreversibly modify (oxidize) biologic macromolecules such as DNA, protein, carbohydrates, and lipids. Enhanced generation of O2− also causes a loss of NO bioavailability. O2− and NO undergo a very fast radical-radical termination reaction to yield a secondary oxidizing species, peroxynitrite anion (ONOO−) and peroxynitrous acid. ROS induce apoptotic cell death in various cell types, and deregulation of apoptosis causes clinical disorders (41). Evidence from experimental animals and human studies has suggested that nonphagocytic NADPH oxidases are a major enzymatic source of ROS generation in ischemia-reperfusion injury, inflammation, hypertension, and atherosclerosis (2,3⇓). In a review by Zalba et al. (3), NADPH oxidase was regarded as the most important source of O2− in the vessel wall of experimental hypertension models, including Ang II–induced hypertension, renovascular hypertension, and genetic hypertension. Guzik et al. (42) reported that vessels from patients with coronary heart disease and with identified risk factors had much higher NADPH oxidase activity than vessels from control groups; they also found that diabetes and hypercholesterolemia were independently associated with increased NADPH oxidase–derived ROS generation. In an animal model of pressure-overload cardiac hypertrophy and failure, enhanced NADPH oxidase activity coexisted with cardiac dysfunction (41,43⇓). Impaired endothelium-dependent cardiac function as a result of increased NADPH oxidase–dependent ROS generation could be restored by treatment with the antioxidant vitamin C or deferoxamine (43). Targeted inhibition of NADPH oxidase protected the liver from ischemia-reperfusion injury (Figure 1) (44). Figure 1. Potential role of nonphagocytic NADPH oxidase in the pathogenesis of diabetic nephropathy. Various factors are involved in the activation of NADPH oxidase and ROS production. Intracellular generation of ROS has dual functions. Increased amounts of ROS inactivate NO to produce ONOO− and at the same time activate redox-sensitive signaling pathways. The major consequences of these reactions are illustrated. Oxidative stress has emerged as a strong pathogenic co-factor in the development of long-term complications of diabetes, such as atherosclerosis, nephropathy, and retinopathy (45). Although the role of NADPH oxidase in type 1 diabetes is still not clear, ROS have been found to be among the first damaging species generated in islet cells after streptozotocin administration in rodents and may kill islet cells (45). An interesting study by Wautier et al. (46) showed that incubation of human endothelial cells with red blood cells isolated from patients with type 1 diabetes but not from normal volunteers activated endothelial NADPH oxidase and increased endothelial ROS generation, which was due to the formation of advanced glycation end products on the surface of diabetic red blood cells. In type 2 diabetes, a major pathophysiological alteration is insulin resistance, and there is a growing body of evidence demonstrating the coexistence of insulin resistance and endothelial dysfunction. Endothelial dysfunction characterized by increased NADPH oxidase–dependent ROS generation has been shown in animal models of diabetes (47,48⇓) and in patients with diabetes (42). As a result of the effects of aging, hyperlipidemia, hypertension, and other factors, patients with type 2 diabetes are more likely to develop vascular and renal complications. The kidney is vulnerable to oxidative damage. Although the origin of increased ROS generation in renal diseases is multifactorial, the kidney is now known to express NADPH oxidase and generate ROS (6,10,13⇓⇓). The expression of p22phox, p47phox, and p67phox has been reported in renal mesangial cells (5), and Nox4 was cloned from the kidney and found highly expressed in renal tubular cells (6,13⇓). Healthy kidneys generate small amounts of ROS, which are tolerated without any apparent damage. However, in the setting of hemodynamic changes, excessive ROS may be produced by dysfunctional kidney cells and cause further injury (10). It has been shown that kidneys from adult spontaneously hypertensive rats (SHR) express significantly higher level of NADPH oxidase and produce more ROS than normal controls (49). In another study, the enzymatic sources of O2− generation were examined in different regions of the rat kidney, and it was reported that a higher NADPH-oxidase–dependent O2− generation was present in renal cortex and outer medulla than in the papilla (50). The ROS generated in the kidney have been suggested to regulate renal medullary blood flow in the long-term control of arterial BP, and increased oxidative stress may lead to renovascular hypertension (3,51⇓). Glomerular mesangial cells are target cells of diabetic nephropathy and endowed with a NADPH oxidase. The endothelial cell lining of the glomerulus is strategically situated at the interface between the blood and the mesangium and expresses a constitutively active NADPH oxidase (49). Exposing mesangial cells as well as endothelial cells to a diabetic environment such as high glucose or free fatty acids activates NADPH oxidase and increases ROS generation (20). Increased levels of oxidized LDL and hyperlipidemia are also potent activators of NADPH oxidase and also recognized as pathogenic factors in long-term complications of diabetes (52,53⇓). In addition, the intrarenal concentration of Ang II is much higher than in the serum. Ang II activates NADPH oxidase in both mesangial cells (17) and endothelial cells (39). More direct, in a rat model of diabetic nephropathy, upregulation of the p47phox subunit of NADPH oxidase and an increase in ROS production has been demonstrated (54). Increased O2− produced within the glomerular microcirculation decreases NO bioactivity on mesangial contraction and arteriolar tone and may contribute to many of the renal hemodynamic and vascular abnormalities observed during the initiation and established phase of diabetic nephropathy. The consequences of oxidative stress may lead to glomerular cell apoptosis, endothelial dysfunction, leukocyte adherence, and impaired coagulation in the kidney (55,56⇓). In summary, the nonphagocytic NADPH oxidase has emerged as a potentially important target to focus on to explore the mechanisms underlying the pathogenesis of long-term complications in patients with diabetes. Modulation of this enzymatic complex could be a promising step to prevent oxidative stress implicated in renal dysfunction. Possible therapeutic approaches include the use of antioxidants or direct pharmaceutical or genetic manipulation of NADPH oxidase expression and activity. This work was supported by British Heart Foundation Program Grant RG/98008. Dr. Shah holds the BHF Chair of Cardiology in King’s College London.